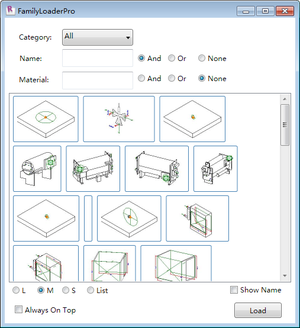 "Family Loader Pro provides a better way for you to manage and use families in Revit. Now you don't need to remember all the complex folder structures at all. You could be able to find family based on several frequent use search conditions like category, name etc. and use it by dragging and dropping which is the most natural way of using family. With this app, you could: 1. Index all your families in order to be found easily later; 2. Perform dynamic and runtime search when search condition is changing; 3. Visually view the family preview like preview in windows explorer; 4. Show/hide family name in the search UI to choose the way of showing search result as you want; 5. Easily drag and drop to use family; 6. Predefine sets of families and batch load in one click." There's a free trial of this add-in on the Autodesk Exchange | Apps website.